Players from all four Gillette Four Nations teams have pledged their support to the White Ribbon campaign, an international initiative to raise awareness about domestic violence issues. “As Rugby League players and sportsmen we act as role models for society, and it is our responsibility to show that we condemn violence in any form. 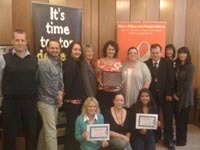 I am proud to be a part of the White Ribbon campaign.” said Jones-Buchanan. “When playing, if a player is violent it damages the whole team, and in life to ignore violence when we know it exists damages all of society. On ‘White Ribbon Day’- Friday November 25 – thousands of men in the UK will be undertaking sponsored silences, educational talks, signing the White Ribbon pledge and undertaking high heeled walks to draw attention to the issue. Burton Albion Football Club is once again teaming up with East Staffordshire Borough Council to raise awareness of the White Ribbon campaign to end domestic violence. This year as part of the WRC’s ‘Blow the Whistle on Violence’ campaign, East Staffordshire Borough Council has teamed back up with Burton Albion to hold an awareness day at the Pirelli Stadium on Saturday 26th November as the Brewers take on AFC Wimbledon at home. Volunteers from East Staffordshire Borough Council and domestic violence partners will be at the stadium on the day selling White Ribbons, and – if needed – handing out information on local domestic violence helplines. Meanwhile the players will spend a few minutes warming up before the game in the White ribbon t-shirts to help promote the campaign and manager Paul Peschisolido and his playing staff will be wearing White Ribbon buttons as part of their pledge never to ‘commit, condone or remain silent about violence against women’. At the end of the match up to 200 white balloons will be released into the air to represent each child in East Staffordshire that so far this year has been affected in some way by Domestic Abuse, whether being a victim or witnessing the violence of a parent/carer. Councillor David Leese, Deputy Leader for Partnerships, said: “East Staffordshire is proud to have White Ribbon town status and the Council continues to do what it can to raise awareness of the support and help available to victims of domestic violence. Burton Albion Manager Paul Peschisolido, said: “We are very happy to team up with East Staffordshire Borough Council to give our full backing to the White Ribbon Campaign. 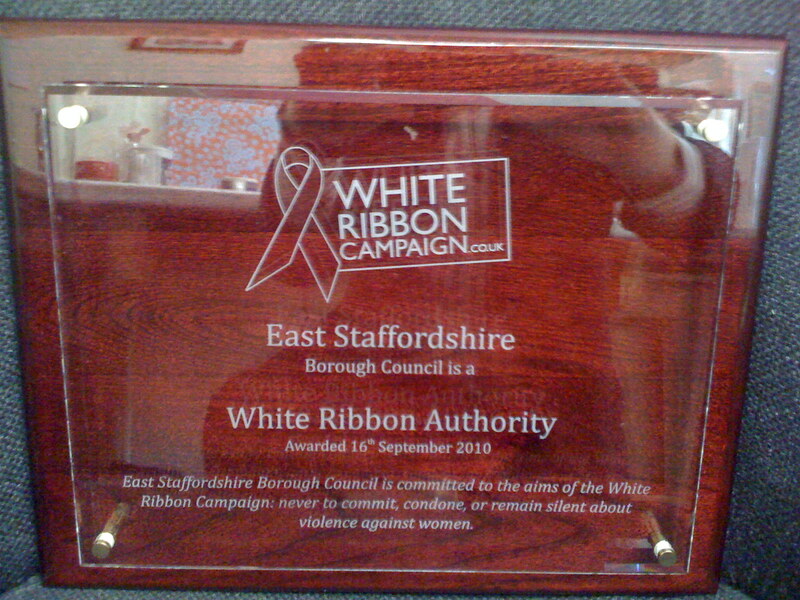 White Ribbon Campaign UK were pleased that East Staffordshire Borough Council became a White Ribbon Authority on 16th September 2010.